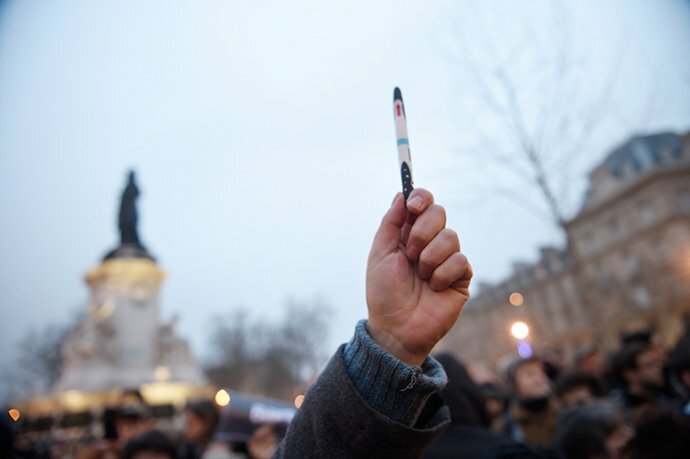 Pen, Place de la Republique. Twelve people at the offices of French satirical magazine Charlie Hebdo were gunned down on January 7. In the same week, Saudi blogger Raif Badawi received the first 50 lashes of his 1000-lash sentence for blasphemy, ironically, an echo of the Charlie Hebdo cover that caused such offense in 2011 — “1000 lashes if you don’t die laughing”. Not to mention the on-going incarceration of Palestinian poet Ashraf Fayad in Saudi also, for blasphemous verses. Islamofascism (still apparently a contested term, but loosely defined as a political ideology based on Islam) has been gaining in strength for decades, but its presence in the West came to public notice in 1989, when copies of Salman Rushdie’s book The Satanic Verses were burned at rallies in this country. Rushdie’s book was a magic-realist novel, in which a retelling of the life of Muhammad appeared in a dream sequence. So it should be no surprise that astrology links the attack on Charlie Hebdo and the Rushdie affair. Interestingly, the “satanic verses“, alleged to have been excised from the Qur’an, were an invocation to the three goddesses worshipped in Mecca before the coming of Islam. Al-Lat was a goddess of the underworld like Erishkigal. Al-‘Uzzá was similar to Aphrodite. Manat was a goddess of fate, like Nemesis. Rushdie still lives in fear of his life. The Japaneses translator of the book was murdered in 1991 and in 1993; in Turkey at least 35 people were burnt to death because of an association with the publishing if the book. Five people were killed in protests against the book in Pakistan. To see more on this, click here. The Satanic Verses was published on September 28, 1988 on a conjunction between Uranus and Saturn in Sagittarius. On the same day Mercury went retrograde in Libra, and the backlash began. The book was banned almost immediately in India and South Africa. Sagittarius is the sign we associate with free speech. It is traditionally the sign of publishing , philosophy and religion. Saturn is the planet of rules, and tricky Uranus is associated with both banning and freedom. Now, Saturn is back in Sagittarius for the first time in 30 years, but Uranus has moved on to fiery individualistic Aries. These two planets will be trining each other this year in fire, igniting the debate around freedom of expression — and the debate is already in full swing. Uranus has travelled far since 1988, trailing change and innovation through our institutions, significantly here, the internet is Uranian, born when Uranus was in his own sign Aquarius. The Internet changed everything about freedom of expression. Uranus is in Aries — each and every one of us is free to express ourselves individually if we choose. Saturn in Sag will be asking some questions about that. It’s not delusional or self-aggrandising to tweet #jesuischarlie: it’s true now in a way it could not have been true to say “I am Rushdie”. Mercury is the planet of the pen, words, wordsmithing — and jokes. Rushdie’s book was also a satire, a jokebook — just as Charlie Hebdo is a magazine of cartoons. In 1988, little Mercury was in Libra Rx: it was all about equivocation and trying to be fair. This time, Mercury had just slipped into the shadow of the coming retrograde in Aquarius, the sign of the people — and we saw more than a million people sporting pens in Paris yesterday, as well as rallies around the globe. Mercury is a wit, and Aquarius one of the comedian’s signs. Cabu, one of the cartoonists killed on January 7, has Jupiter in Aquarius. That Jupiter is transited by Venus and Mercury today – bless him. Georges Wolinski’s North Node and Moon are there too. All of this has, of course, taken place under the last leg of the Uranus-Pluto square, which was reignited by the Full Moon on January 5. This dramatic aspect opened with the Arab Spring and the two mighty planets will have their final encounter in March. After that we will have to deal with the resulting changes. I mentioned in my overview of the year — for subscribers — the similarities between 2015 and 1968, the year after the Uranus-Pluto conjunction — which was extremely event-filled. Yesterday, Anonymous finally declared war on “Al Qa’eda, the Islamic State and other terrorists”. Frankly, it’s about time. The hacktivist group — a secret, global organisation (Pluto in Capricorn) of anarchist activists (Uranus in Aries) is one of the best defences against another secret global organisation of psychopathic warriors (Uranus in Aries). However, the important question is how can we live together in harmony? And this time there has been an answer to that. At all the rallies, people were holding pens as a symbol of civilisation. We in the west — that includes Muslims — need to understand what binds us together, what values we share, and many of those values are symbolised by Mercury: reason, education, intelligence, conversation, listening — and wit. Mercury in Aquarius, the sign of humankind, holds hands right now with Venus, the planet of values. Mercury stays in Aquarius until mid-March, just before the final square between Uranus and Pluto, giving us a good chance to talk it all through, like the civilised people that we are. Ordered that bood satanic verses! Happy your able to write despite breaking your wrist, hope you have a speedy recovery!